Whether you're a beginning knitter or advanced, whether your tastes range from simple knit-purl stitching to fancy Daisy or Moroccan screen, a dictionary of stitch patterns is indispensable! Young knitters, old knitters, hip knitters, traditional knitters: they all enjoy different styles. But every knitter from age 5 to 95 needs a good dictionary of stitches. 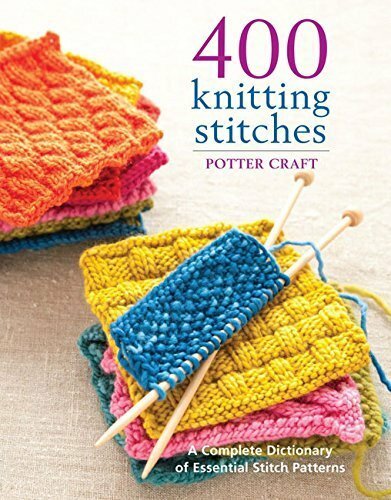 400 Knitting Stitches is a comprehensive guide that invites knitters to experiment with a variety of new stitch combinations. The book is conveniently divided into eight categories: knit-purl, crossed and cables, slipped, lacy,double, twisted, cast-off, and fancy stitches. Making a romantic lacy wrap or a classic cable sweater? Whatever your style, there's a stitch in here for you. Each of the 400-plus featured stitches is accompanied by easy-to-follow written and charted instructions,as well as a full-color photograph. A section on basic knitting information and techniques at the front of the book makes this volume even more invaluable. From advanced knitters experimenting with their own designs to beginners looking for clear instruction and explanation, 400 Knitting Stitches is an essential reference for knitters of all kinds.